A Chief Digital Officer and self-styled “future hunter” explains why companies need to investigate the potential of blockchain—now. When I was 16, with a newfound understanding of how to write code and uninspected ambition, I set out to create my first Internet application. I was a teenager with the power of the Internet in my hands. Unfortunately, I was blinded by what I saw. As a user of AOL Chat, I wrote what I thought was a better chat app. And it worked. But of all the applications that I might have developed leveraging the power of the Internet—a YouTube, say, or a GitHub—I settled for simply creating a better version of an app that already existed. I learned something from that experience. I learned that you need to try and imagine what the latest big thing might mean in the future—future hunting if you will. For example, today we are all preoccupied with Bitcoin. Indeed, when it first appeared, I was intrigued. I did some Bitcoin mining and some Bitcoin exchanges. But within a year or two, it was something else that got me excited: blockchain, the underlying protocol of Bitcoin. I saw that Bitcoin is to blockchain what AOL Chat was to the TCP/IP, the foundation of the Internet—simply a first demonstration of a powerful protocol. I wanted to avoid the mistake I’d made as a teenager. I didn’t want to be trying to write a better coin app while overlooking blockchain’s tremendous and far-ranging potential. At the same time, I struggled with a question: What sort of problem worth tackling could blockchain, with all that potential, solve? We live in a world that systematically permits us to misrepresent data to each other. Hundreds of trillions of times a day, data exchanges take place between people, between businesses, between people and businesses. And data usually comes to us and says, Hi, I’m data, trust me…*wink, wink*. But we don’t have a good way to check, to be sure that the data hasn’t been massaged or manipulated or even fabricated. 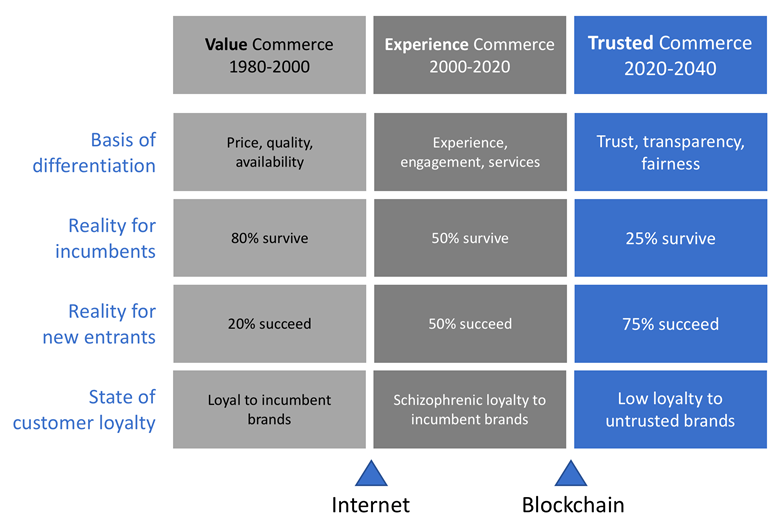 This is an entirely new paradigm, one that potentially makes blockchain the foundation of what I call “trusted commerce.” Why is that important? Because companies that understand this—that realize the significance of adding absolute transparency to the information supply chain—are likely to gain a powerful advantage over rivals. Start with a somewhat simplified example. I happen to have a restaurant as a hobby investment. When someone writes a negative review, I take it personally. But I have no idea, first of all, whether that person actually dined at the restaurant. I don’t know the identity of the person writing the review. For all I know, “catlover1465” may well be a competitor—who may at the same time be writing a great review about his restaurant! A review published using the blockchain protocol would be part of a distributed system of entities that would replace blind faith in a review’s validity with well-founded trust. A blockchain-enabled restaurant review system would obviously include the restaurant and the reviewer. But it could also include credit card issuers and a point-of-sale system to verify that the reviewer actually ate at the restaurant and in fact had the dishes discussed in the review. It could include other parties with data relevant to a restaurant’s quality—for example, food suppliers and the local department of health. And the data generated by the various parties would be governed by a set of rules that would guarantee its trustworthiness. Here’s an analogy for how blockchain works to increase our trust in data. Picture sitting in a polished sales presentation— and being able to click a button that revealed every single version of each PowerPoint slide and showed how the information had been massaged by various participants before the presentation was deemed ready for public viewing. This kind of transparency and trust can be built into all kinds of business-relevant data. Until now, interest in blockchain has generally focused on financial services data. But the protocol can also be applied to identify data, to inventory data, to market data, to the data behind product claims, to agreement data, to corporate data. For example, what if you built trust into the data that company divisions feed into the budgeting process?! Over the last 50 years, we’ve done a lot to increase transaction speed and reduce transaction costs through automation. We’ve improved transaction reach with the Internet. But we haven’t done much to increase transaction trust. We still live in a state of commerce where we can almost systematically lie to each other by passing back and forth data sets that can be manipulated and are often hard to verify. Granted, traditional mechanisms exist to help us to trust data we receive. We rely on legal contracts and their imposition of liability when information related to the contract turns out to be false. But most information isn’t covered by a formal legal contract, and in any case, getting relief under one is costly and time-consuming. We rely on intermediaries—entities like banks, government agencies, title companies, audit and rating services, and analysts—to serve as independent verifiers of such things as, say, an airline’s maintenance record or a company’s capabilities. But intermediaries can’t always be trusted. A government agency may be understaffed and rely on the companies they regulate for their information. Rating services and analysts may not be as independent and objective as they seem. We rely on our familiarity with members of, say, a business network to validate the information we receive. But such networks are only useful in certain situations. And although they may increase our comfort level with information we receive they don’t guarantee its accuracy. We rely on a company’s brand in deciding whether to believe its marketing claims. But we have seen far too many times that even the most trusted brand can be an unreliable indicator of truthful information. In the end, we often base our trust on a gut feeling. Think of Uber, and the amount of trust we have to initially manufacture with our gut to get into a car with a stranger. And gut-based trust is on the rise, as we transact more things with more people at a greater distance in more ways than we did in the past. This is why I believe that trust is the next competitive differentiator, that companies who seize the opportunity to compete on the basis of trust will soon achieve a powerful competitive advantage. Over the years, businesses have competed on such things as product features, product quality, pricing, supply chains that offered immediate availability. More recently, as many sources of competitive advantage became commoditized, “experience” has come to the fore. A company is able to disrupt an industry by creating a better experience than rivals with similar products. Well, within the next decade, I think the company that has trust as a differentiator will disrupt rivals that don’t. Another way to put it: Very soon, every company will find itself at risk of being disrupted by a trusted version of itself. There’s a difference in competing on trust from competing on experience or product or pricing. Trust is a first-to-market game. If you’re first to market with new product features but without offering a great experience, a fast follower can come along with experience and beat you. Or you can offer a great experience and someone can come along and beat you on price. But trust, when it’s deserved, is difficult to disrupt. Human beings aren’t likely to stop trusting someone they trust and then start trusting somebody else. It’s just not in our genes. Interestingly, this is going to happen to individuals, too. That is, every person will be at the risk of being disrupted by a trusted version of themselves. Think of LinkedIn. It arguably is the website with the most lies on the Internet. It’s a place where you can openly go and misrepresent yourself, and practically no one will challenge you. Then think about LinkedIn versus resumes on a blockchain, and what those blockchain resumes would do to the recruiting and the hiring process. If you’re applying for a job, there’s a website called Glassdoor, where you can go and check to see which companies are hiring and whether they are good employers. But the best thing employers generally have to assess the accuracy of a job candidate’s resume are references. And when was the last time a candidate gave you the name of someone who would tell you the truth? If a company has a choice between two similar candidates, they will choose the one whose resume has been verified through by blockchain-like process. Why do I think that the scenario I describe is going to happen? Why do I think we’re about to experience a trust revolution in the commercial world? Revolutions tend to happen when three things align at the same time. First, there is a legitimate argument that there has to be a better way. And we’re seeing that here, if you think about the difference between data that comes to you and says, Trust me – don’t worry, as opposed to data that comes to you and says, You don’t need to trust me, you can test me. The second thing that leads to revolutions is enough power in the hands of youth to drive a change. And if you look at blockchain, we’re seeing a situation where young people are at the forefront. The CEO of IBM’s number one blockchain competitor, Ethereum, is 23 years old. The young not only have growing spending power, they have in blockchain a tool that will allow them to redesign commerce to suit themselves. The third condition is that the populace believes some sort of change can happen in a short period of time. And blockchain momentum is gathering rapidly. Last year I gave a local TedX Talk on blockchain—not on the big Ted stage but at an event in New Jersey—and the YouTube video of the talk has 650,000 views. That’s more than half a million people interested in blockchain. If you added up all the YouTube videos about blockchain, the total viewership will be many millions. If you have these three things in place, a revolution often results. And I’d say that the blockchain revolution is imminent. Every trade magazine has had a blockchain cover in the last 12 months. Fifty percent of the governments in the world have some sort of blockchain experiment going on at the moment. I don’t believe that things standing in the way, such as concerns about privacy, will stop a movement so significant. In five to ten years, this revolution will be everywhere. I think we’re about to see a colossal slaughter. This is not about, say, GE becoming a better GE. This is about waiting for GE to get knocked out by the trusted version of GE. For many people, blockchain means Bitcoin, the increasingly popular digital cryptocurrency. But the idea behind blockchain—creating trust in the information on which transactions are based—is widely applicable, in business and other realms. Making it possible for buyers and sellers to trust each other has been a problem in business for thousands of years. And for the last millennium or so, the best solution has been to create a ledger held by some trusted intermediary, such as a bank or a government. Today, many such intermediaries exist but mostly just to hang on to high-tech versions of that same old ledger. First, every transaction is encrypted with a unique key. This makes it almost impossible to tamper with – especially given that each transaction incorporates and re-encrypts every prior related transaction (hence the name, blockchain). Second, when a change is made to a record and stamped by a trusted party known to others in the chain, copies of that record are sent to ledgers on every node. Periodically, an algorithm verifies that each of those distributed ledgers is exact copies of each other, and throws out any transactions that don’t match all the other copies. The upshot: a would-be tamperer in a blockchain system would not only have to break the encrypted code of a record but simultaneously change thousands or millions of copies of that same record at the same instance. Blockchain, by creating trusted exchanges of information, will lead to a profound revolution in commerce. Trust will be a powerful competitive differentiator. Companies have to learn to be transparent or get ready to be replaced by a more trusted version of themselves.